Our glow Sticks pack is a huge hit at any party. Whether you are using it as a bracelet or connecting them together to make necklaces or crowns, balls, flowers or rings, glow sticks are Fun!!! Fun!!! Fun!!! for all ages. 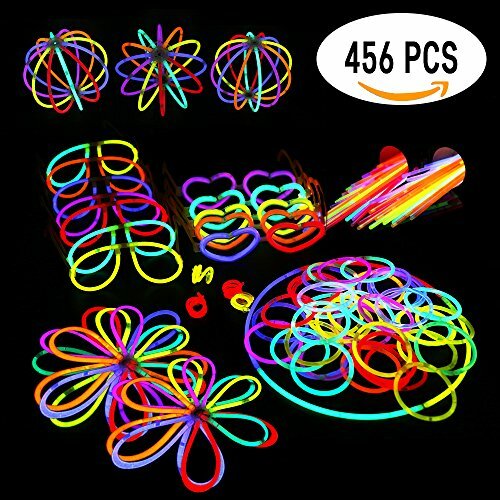 The package includes 200 high quality 8" Glow Sticks (2 Tubes of 100), 200 Bracelet Connectors, 7 eyeglasses connectors, 5 heart eyeglass connectors, 12 Flower/ Ball Connectors, 4 spiral rings. Glow sticks colors: red, yellow, blue, green, pink and orange. Easy to use, there are two kinds of liquid in the plastic stick, when you bend the stick, the two-liquid mix together and glow, then you connect the two ends with the connectors. ❤️PACKAGE CONTENTS: 200 high quality 8" Glow Sticks (2 Tubes of 100), 200 Bracelet Connectors, 7 eyeglasses, 5 heart eyeglass, 12 Flower/Ball Connectors, 4 spiral rings. Glow sticks colors: red, yellow, blue, green, pink and orange. ❤️PREMIUM QUALITY SUPER BRIGHT & LONG-LASTING ILLUMINATION these are the BEST glow sticks, nothing but the highest quality glow sticks. They will glow super bright for hours of illumination to outlast any event or festivity. Awesome and Eye-catching. If you don't crack/activate the sticks, you can keep them till your next party. ❤️ALL INCLUSIVE PACKAGE GREAT PARTY MAKER Perfect for birthday party, graduation, wedding, concert shows. Make the atmosphere so cool. Use your imagination and fantastic ideas to make all types of lights and bring happiness to everyone. ADULTS AND KIDS WILL LOVE THEM. They are great party favorites for everyone. You can give them away to your children, grandchildren, nieces and nephews. ❤️EASY TO USE: bend, snap and shake the stick and it will glow. ❤️SAFE: Non-Toxic, Non-Flammable, Non-radioactive, Water-proof. If you have any questions about this product by Light Up My Party, contact us by completing and submitting the form below. If you are looking for a specif part number, please include it with your message.